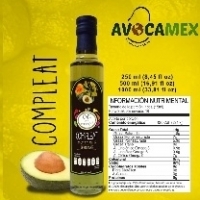 Extra Virgin Avocado Oil by Meroc Tech. Supplier from Mexico. Product Id 881378. 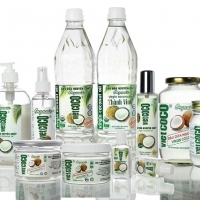 Virgin coconut oil (VCO) can be produced from fresh coconut meat, milk, or residue. Producing it from the fresh meat involves removing the shell and washing, then either wet-milling or drying the residue, and using a screw press to extract the oil. VCO can also be extracted from fresh meat by grating and drying it to a moisture content of 10–12%, then using a manual press to extract the oil. Producing it from coconut milk involves grating the coconut and mixing it with water, then squeezing out the oil. The milk can also be fermented for 36–48 hours, the oil removed, and the cream heated to remove any remaining oil. 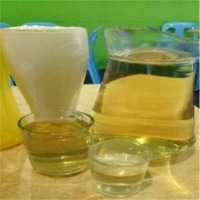 A third option involves using a centrifuge to separate the oil from the other liquids. Virgin coconut oil looks slightly different from ordinary coconut oil and this differentiation cannot be made with the naked eye. This difference is mainly due to the presence of certain colloidal and other particles and moisture within it. 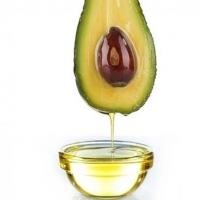 On the other hand, ordinary oil is refined and is mainly left with the fatty acids in it and almost nothing else. Ideally, virgin coconut oil should be as clear as water. However, its color may vary slightly depending upon its processing. 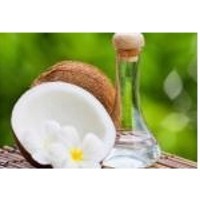 Virgin coconut oil has a very good taste and smell, like that of fresh coconuts, since it is derived from fresh coconuts and is subjected to very low, if not totally nil, heat and sunlight. It is also not refined. This preserves all the natural goodness of this oil, including a high content of vitamin-E and minerals, which are otherwise almost completely robbed from ordinary coconut oil during processes like heating, filtration, refining, and bleaching, which are done to make it colorless and odorless. Furthermore, virgin coconut oil is very effective as a moisturizing agent. Its antioxidant properties are far better than those of normal coconut oil. Search More Like "Extra Virgin Avocado Oil"